PHOTO BY MATT YEOMAN A fall 2013 dance class at SUNY Brockport, led by Dr. Darwin Prioleau (top row, center). Garth Fagan first became affiliated with the SUNY College at Brockport Department of Dance in 1970 when he began teaching a course called "Dance for the Disadvantaged" —a course for students with no prior dance experience. Fagan had just given up performing as principal dancer and choreographer with the Dance Theatre of Detroit and was New York City-bound when he took a detour, accepting the Brockport position on a temporary basis. That temporary basis turned into a three-decade professorship that acted as magnet for students and professors alike, doing much to help establish the college's prominence among other collegiate dance programs. "I was young and in touch with the times," Fagan says. "I was a child of the 60's myself, out in the muck and mire of Woodstock. I used music of the times in class — Jimi Hendrix was a friend — and the kids were enthusiastic. I gave them more than just the same old, same old. But, I also knew that the choreography bug had already bitten me and that teaching wouldn't be enough for me." Steve Humphrey was in that first class, a freshman then, and new to dance. Fagan recognized Humphrey's potential and soon had him rehearsing with another young group of dancers in a gymnasium on Andrews Street, part of the Educational Opportunity Center. This group grew into The Bottom of the Bucket (later to become Garth Fagan Dance), which performed locally at places like Midtown Mall before staging its first official performance in Buffalo in 1970. The company premiered at the prestigious dance festival Jacob's Pillow to rave reviews just four years later. Today, at 61, Humphrey still dances for Fagan; his is just one of Brockport's success stories in dance. If you look at Rochester's dance scene as a whole, many of its participants — dancers, choreographers, teachers, company leaders — have been involved with the College at Brockport in some capacity. The school has had a key role in developing dance talent in our area, and its influence ripples far outside Rochester's borders. Kevin Warner, recently appointed chair of Brockport's dance department, credits Fagan and other predecessors for helping establishing the dance program in the 1970's and 1980's. Today, the college reaches out to alumni — both professors and students — asking them to return to conduct master classes, hold workshops, or speak on panels as guest artists. "We bring alumni back in to give students a chance to learn about a new aesthetic, or about an old or new niche in dance," Warner says. For instance, Nicolette Depass, also a Brockport dance graduate and a longtime member of Garth Fagan Dance, will be speaking on a panel at the college this spring. Warner attributes several factors to Brockport's national recognition as a select college for dance studies. First, it's about students eager to study with high-caliber professors — many on faculty can boast both national and international credentials. Then there are the school's facilities: two theaters, five studios, a conditioning lab, a fitness pool, and a costume shop. Ultimately, it may be the wide range of dance degrees Brockport offers that attract potential students. 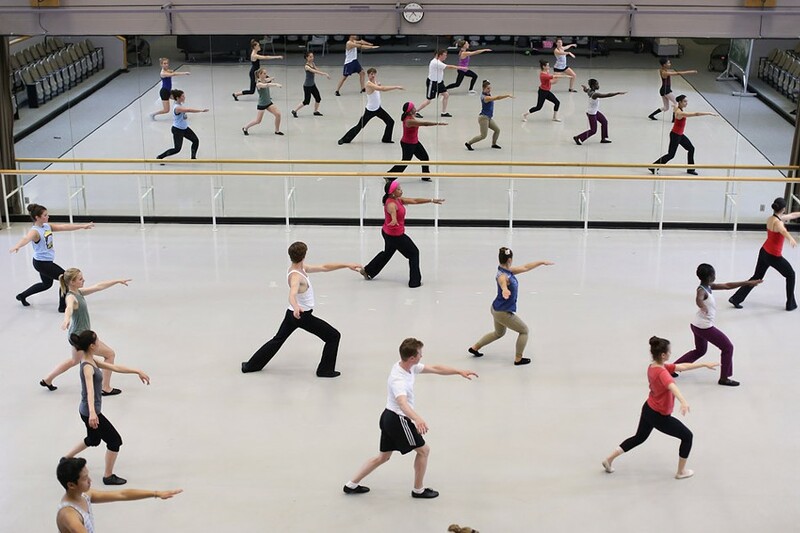 Undergraduate students can earn a BA, BS, or BFA in dance; graduate students a MA or an MFA. According to Warner, students can personalize their studies to some degree, tailor them to their aptitudes and interests. The modern-dance-centered program includes a range of approaches to modern, as well as studio courses in ballet, contact improvisation and partnering, tap, African dance and drumming, and Irish dance. Choreography, dance history and theory, teaching methodologies, somatics, and movement analysis are all areas of student exploration. "Brockport is distinctive in that its liberal-arts philosophy allows students to pair dance and other disciplines," Warner says. "We really try to create three-dimensional dancers and people, not just choreographers and dancers. Scholars and thinkers. They apply the skills they acquire through dance — critical and innovative thinking, problem solving — to other careers." Warner had been on the dance faculty for six years before he was appointed chair of the department last summer. He continues to teach Interdisciplinary Arts for Children, a unique major that prepares students for a variety of careers in education and the arts. The program has a partnership with The National Museum of Play, which provides Brockport students with a venue for practical application of learning. Clyde Morgan, associate professor of modern and African dance at Brockport, has been teaching at the college since 1986. He is also the director of Sankofa African Dance and Drum, an African dance group based out of the college that has achieved international recognition. Khalid Abdul N' Faly Saleem is the company's musical director. Morgan recently returned from Brazil with a select group of Brockport students participating in the college's International Studies Program. "This program is another of Brockport's strong points," Morgan says. "Students are made aware of dance styles in their cultural context. They are taught by people of authentic origin and completely immersed in the culture." Like Warner, Morgan helps his students gain stage experience through performing for young people. He utilizes the national nonprofit Young Audiences program that contracts "trainer" artists in cities across the country. As a trainer with Young Audiences of Rochester, Morgan is able to bring on student assistants. "Students learn how to interact with the community through this program," he says. "It's a valuable tool for them." Morgan also praises Brockport for offering guest artists, residencies, recruiting opportunities, and fellowships to the college's students. Mark Morris, Martha Graham, The Limon Company, and Doug Varone have all held residencies at the college. "We're the motherlode," Morgan says. "There's no other collegiate dance program like ours in the region." Mariah Maloney, currently the director of the dance graduate program, spent eight years as a soloist with the prestigious Trisha Brown Dance Company. "I chose to come to Brockport because it is a serious creative place where students and faculty are deeply immersed in their work," she says. "There is a depth of artistry inherent in the place, and the program reflects that." William Evans is another of the college's high-prestige professors. Evans is the artistic director of the Bill Evans Dance Company, one of the most-booked companies in the country for several years under the Dance Touring and Artist-in-the-Schools programs of the National Endowment for the Arts. He is renowned for his work in both modern dance and rhythm tap, and has been teaching at Brockport since 2004. "Dance programs in this country are quite young for the most part. We're one of the older ones now," Evans says. Brockport dance graduates Guy Thorne and Heather Roffe both cite Evans as a mentor. Thorne was already dancing professionally with Garth Fagan Dance when he started working towards his BFA degree in dance from Brockport. "I could immediately apply what I was learning in Bill's classes," he says. "He gave me tools to use, information I could take to the bank." Thorne is now director of Futurpointe Dance, a genre-bending company that has moved swiftly toward recognition in the dance world. Including Thorne, five of its members studied at Brockport. Another five apprentices from the college are currently working with the company. "A lot of Brockport grads are working in their field of study," Thorne says. "A lot." Roffe, also a founding member of Futurpointe, and now associate professor of dance at Nazareth College, agrees. "Brockport offers a well-rounded program," she says. "I felt very prepared upon graduation to confidently go out and feel I had something to offer in a higher education institute." In March, the college will host the 2014 American College Dance Festival Northeastern Conference, which showcases the best dance talent from the region. Two concerts featuring full-time and adjunct college faculty will be held on March 12 and 13 at the Hartwell Theatre.